Poker PROductions, the producer of the World Series of Poker, had one goal in mind when it hired Innovative Show Design: creating the world’s largest most elite poker sporting venue. That goal was realized in a set that’s 110 feet wide by 65 feet deep and stocked with over 700 lighting instruments controlled by 288 2.4K dimmers. The set boats a dramatic deep blue color scheme accented with reds and sleek, polished surfaces accented with color changing LED lighting. The centerpiece of the set is a circular LED ticker suspended from circular trusses in the center of the environment. Suspended from this are additional LED flat screens, all powered by a Maxedia Media Server. Like its work for NBA TV, Innovative Show Design worked to create a dynamic set that captures key elements for the sport using the set as an arena, giving the World Series of Poker a set that creates a high tech, futuristic feel that captures the excitement and high stakes of championship poker. “I can’t wait to make it to the main table and play in the mother ship,” commented one player. 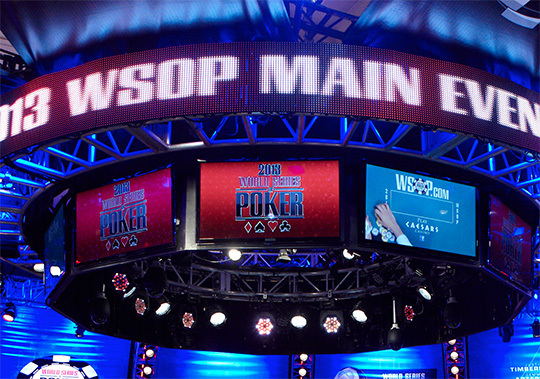 Most of the action takes place at the set’s main and secondary poker tables, designed for nine players, which are outfitted with 18 hole card cameras to give viewers an inside peak at the game. A total of 21 cameras capture all the action at the main and secondary tables, with an additional 16 handheld cameras for outer table coverage. 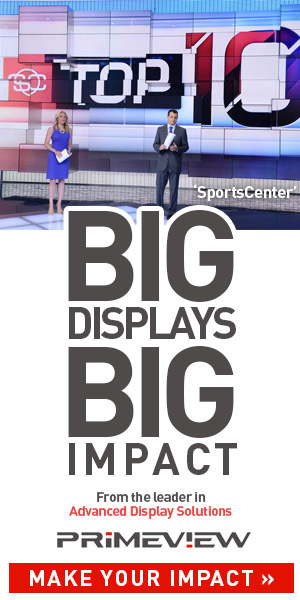 “The set needed to be technologically advanced and impressive in size. This is where thousands of people come to win millions of dollars, compete for the WSOP bracelet and be crowned the world champion. The set and lights needed to portray that message,” explained Justin Garrone of Innovative Show Design. 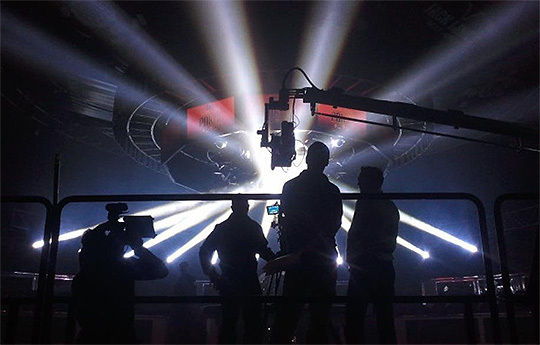 The production was supported by four television production trucks, and over 200 crew members. Behind the scenes, producers had access to 41 channels of video ingest and systems that kept realtime tallies of player cards and chip counts. The design process for the set required extensive attention to detail. Not only was there significant collaboration incorporating feedback from all parties involved, but there were structural and engineering challenges as well. The set had to be designed in a way that would fit into both the Rio Hotel and Casino’s Amazon ballroom as well as within the Penn & Teller Theatre’s proscenium while still maintaining all of the elements. Designers also worked closely with a team of engineers to ensure the weight of the trusswork, lighting gear and other scenic elements wouldn’t cause any issues with the building’s structural integrity. 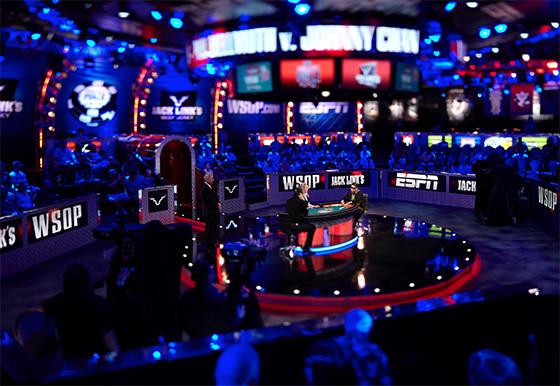 The set was used starting in May for the first of 62 events of the World Series of Poker, with a scaled down version. The full version of the set is used for event 62 (the main event) with a field of over 6,000 players. Once it’s down to the final nine players, the final table takes place in the Penn & Teller Theatre.